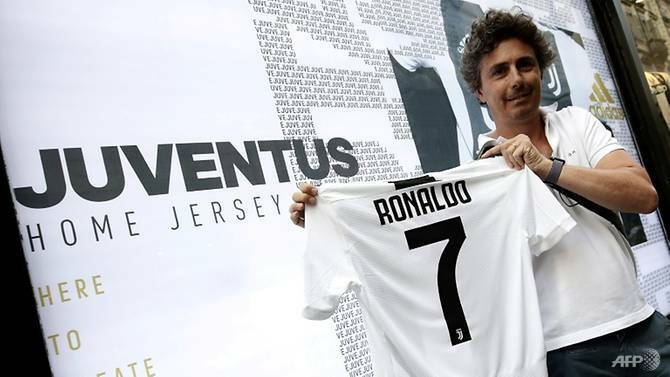 Italian media was bubbling with enthusiasm Wednesday (Jul 11) after Serie A club Juventus announced the €100 million "deal of the century" and wrestled superstar Cristiano Ronaldo from European champions Real Madrid. The country's number one daily the Corriere della Sera led the cries of joy at Ronaldo's arrival by acclaiming a "dream come true", while La Repubblica hailed a "117 million-euro dream", referring to the huge investment Juventus will make in their marquee signing. La Repubblica breaks down the cost of the deal to Juventus as €100 million going to Real Madrid, a €5 million "solidarity contribution" paid to FIFA and €12 million "incidental costs". The Corriere della Sera believes that the latter sum is actually the commission being paid to those who facilitated the transfer - principally Ronaldo's agent Jorge Mendes. The front page of Italy's principal sport daily Gazzetta Dello Sport has Ronaldo exclaiming "I'm coming!" after what it calls "the coup of the century". Rome-based paper Il Messaggero meanwhile acclaimed club president Andrea Agnelli for pulling of the "deal of the century". "A spark has been lit, let us rejoice," said Corriere Della Sera columnist and Juventus fan Pierluigi Battista. "And to think that we saw him as unpleasant, CR7 ... with his arrogant attitude, statuesque posing and perfectly defined muscles," continued Battista. "But he was applauded by the whole stadium for a scissor kick of absolute beauty that he inflicted on Juventus (in the first leg of the quarter-final of last season's Champions League). We understood that this beauty could and should be ours." Turin-based daily La Stampa, owned by the Fiat Chrysler Automobiles group that is in turn the majority shareholder in Juventus, claimed that "everyone will watch us". "Just think that he has more than 300 million followers on social networks, that he is known in every corner of the globe and that he is one of the five most famous celebrities on the planet. Suffice to say that there will be a positive impact not just for Juve but for the whole of Italian football." Sports daily Corriere dello Sport led with "Fiat Lux", a play on the Latin phrase meaning "let there be light" and the world famous car brand. Italian media reports that Ronaldo will be unveiled, after a medical, on Monday morning at Juve's state-of-the-art Allianz Stadium, where he is set to receive more standing ovations like the one given to him by Juve fans in the spring.